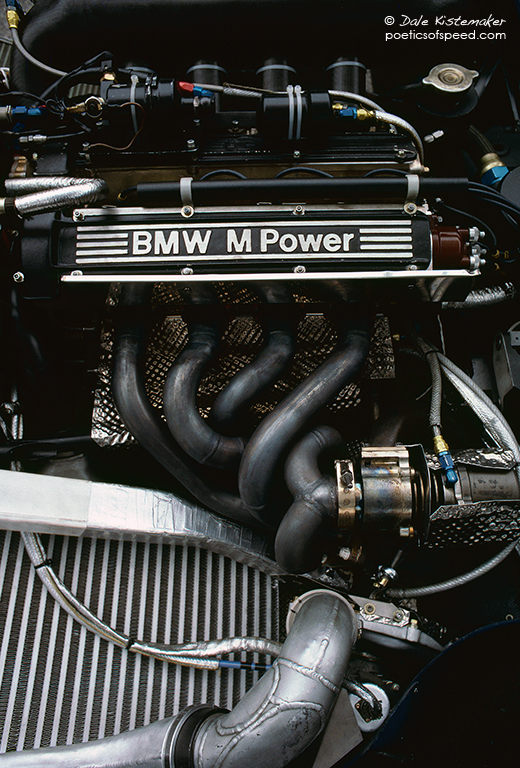 “…And so began one of the most exciting eras in BMW’s motorsport history. They teamed up with Brabham, then managed by Bernie Ecclestone, alongside Gordon Murray as vehicle designer and with Nelson Piquet at the wheel. Lacking a dynamic engine test bed, Rosche was unable to simulate driving conditions in the test cell, opting instead to do so on the test track. This led to the very first application of telemetry in racing. Nowadays a race team can tell when a driver is about to sneeze from half a mile away. But not so in 1981. Rosche had heard that the Munich-based aircraft builder MBB had telemetry for the development of helicopters. So he bought some of its equipment and installed it in a Ford van, which had to be kept within range of the race car in order to pick up the signal. First they tried following the car around the track, which led to the screws parting company with the equipment. Then they tried hoisting the antenna 30m in the air with a balloon. That worked until the police politely invited them to stop. Finally, the poor electronic engineer with the dubious honor of driving the truck built a 3-minute memory. BMW’s first year in Formula One was fraught with problems, mainly due to the electronics. When they failed to qualify in Detroit, that was the last straw for the Board, who were ready to pull out. Whatever he did, it worked. Piquet drove to victory in Montreal. Relieved and elated, Rosche brought his engine back to Munich for analysis. “We put it on the test bed, and it didn’t work. It was completely dead. Basically, we won our first race without ever knowing why.” Rosche finds this particularly amusing, although presumably 20 years ago his sentiments were somewhat different. BMW’s F1 glory year was 1983, when it scooped the championship, a victory that Rosche puts down largely to a special fuel developed with BASF. The fuel, which was originally used by WWII fighter planes, successfully eliminated the high-speed detonation problems being suffered by other teams at the time. But the secret was soon blown after the Italians stole a barrel of it during the Grand Prix in Monza. In 1984, with all the teams using the same fuel, Rosche sought to regain the edge by increasing turbo pressure. “The crankshaft couldn’t take the power increase,” he laughed. “So we strengthened the housing. Then the turbocharger flew apart as a result of the increased speeds. “That was a real pioneering time for us. In the end we never really knew how much power we had. We calculated through the intake pressure at around 1440 bhp.